Home » Three Stooges short films » Spooks! Spooks! (1953) is a Three Stooges short film featuring Moe Howard, Larry Fine and Shemp Howard as three inept detectives who are hired to find Bea Bopper (Norma Randall), who has been kidnapped by mad scientist Dr. Jeckyl (Philip Van Zandt), who plans to transplant her brain into that of a gorilla. The Three Stooges go to the girl’s last location, “cleverly” disguised as pie vendors giving away free samples. Hearing the girl scream, the Stooges break into Dr. Jeckyl’s house, track them down, and enter the mad scientistâs hideout disguised as pie salesman, and encounter the mad Dr. Jeckyl, his henchman Mr. Hyde and the gorilla. First come the typical haunted house shenanigans that we’ve come to expect from the Three Stooges (hidden panels, daggers and cleavers being thrown) — one nice touch was a “Snuffleupagus” moment, where a knife is thrown at Shemp, but the evidence is taken by Mr. Hyde while Shemp fetches the other Stooges, so Moe thinks he’s crazy. Moe then takes Shemp with him while Larry stands guard, and the situation repeats, finally with Moe being the one seeing the attempt on his life. Eventually, they find and rescue the girl and, with the aid of the cream pies that they brought as their samples, the villains are captured. But how to escape the gorilla? By letting it throw pies at Moe, Larry, Shemp and Bea, ending the short film with a round of laughing at themselves. One noteworthy point is that Spooks! 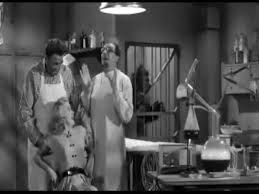 is one of only two Three Stooges short films that were released in 3-D, and the short film makes the most of this, with the mad scientist aiming a needle directly at the audience, throwing pies, etc. It has several cute moments, such as Shemp making a word play on âbebopâ, and the close-up view of âa hideous, monstrous face!â of a batâwith Shempâs face! A cute short film, but nothing exceptional. Spooks! is available on DVD as part of the Three Stooges Collection, Volume 7. Moe: What did you do? Shemp: What do you want us to cover up for? Shemp: Oh a bee bopper! Dig that crazy bopper name! Cool man, real george! Give me some skin! Shemp: It won’t work, and I ain’t goin’! Shemp: It’ll work perfectly, what are we waiting for? Shemp: I can’t see! I can’t see! Shemp: I got my eyes closed. Shemp: Moe! We’re trapped like rats! Shemp: There’s something fishy going on! Miss Bopper: No, no Dr. Jekyll! 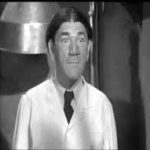 Shemp: Dr. Jekyll? We must hide! Shemp: Fellas, fellas, I found the girl, and a great big chimney-pansy [chimpanzee] — he looked just like my mother-in-law.